The league supplies batting helmets as part of the standard equipment bag. However, we acknowledge that some players may want to bring their own. We highly recommend that your player be present to test fit the helmet before you make the purchase. Regardless of whether you are looking for a helmet for softball or baseball there are some common criteria you will want to keep in mind when purchasing a helmet. Fit: The helmet should not "wobble" on the players head. It should rest comfortably, but not so loosely that it moves when the player runs or turns their head. Ears protection: Some helmets protect both ears while others protect only the one. For single ear protection the left ear should be protected for a right handed batter and right ear for a left handed batter. Padding: Helmets must have padding and should be secure and not loose. Look for helmets with the NOCSAE ® lable. This indicates that the helmet conforms with the NOCSAE ® standards for safety. Softball players should note that ASA rules require helmets be NOCSAE ® compliant. Beginning in January, 2018, all ITBL players must use a bat with the new "USA Baseball" stamp (Not USSSA) and bats without this stamp will not be legal. Bats with the 1.15 Bat Performance Factor (BPF) stamp will not be legal after January 2018. Essentially, the new bat standard ensures that the exit velocity and performance of the bats closely mimics that of wooden bats. This is done to preserve the long-term integrity of the game along with increasing safety for pitchers and infielders. As this standard is relatively new, bat companies are in the process of releasing 2018 USA Baseball stamped bats. In general the league provides bats for each team whether it's Tee Ball, Baseball, Softball. The bats selected by the league are considered appropriate for the program in question. Generally each team bag has a selection of bats for players to choose from and vary by size and weight. However, we also recognize that players may want to bring their own bats. Bats will need to be approved by the team's coach before they may be used. We frequently encounter situations where a player's bat is not appropriate either in terms of it's length or weight. Here are some general guidelines to consider when purchasing a bat for your player. Length 24"-26" 26"-29" 28"-30" 29"-32"
Length 24"-26" 26"-29" 28"-30" 29"-32" 31"-34"
The "Wingspan" method is another way to determine the size of the bat appropriate for your player. 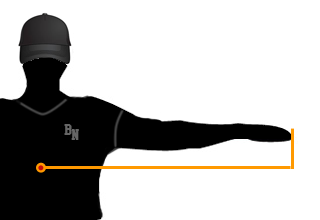 Have your player stretch his or her primary arm out straight and to the side as shown in the illustration. Fingers should also be straight and pointing away from the body. Now simply measure from the center of the body to the tip of the fingers to find the proper length. Alternatively, simply lay the bat across the chest and down the arm. If the length of the bat falls between the wrist and finger tips, then you are in the correct range. If the bat length falls short of the wrist then you probably have a bat ths is too small for your player and conversely if the end of the bat falls past the finger tips then the bat is too long. Drop refers to weight or more specifically it is the difference in length as compared to the weight of the bat. So for example a 30" long bat with a drop of -10 weighs 20 ounces. In general a lighter bat will impart less energy when the ball is hit, but will allow the batter to have a faster swing. The diameter of the bat is also a factor to consider. You will find a variety of bats on the market with some ranging as much as 2 3/4" in diameter. These larger diameter bats are often termed to be "big barrel" bats. A good general rule of thumb is that a baseball bat should be 2 1/4" and may NOT exceed 33" in length. As of the 2018 season, the maximum allowable diameter for our intertown league is 2-5/8″ (from 2-1/4″). Softball bats are also 2 1/4" in diameter. USSSA youth baseball will NOT be implementing this rule change to the bats. Hence, you may hear conflicting information regarding which bat standards to adhere to. BNBSL does NOTuse USSSA standards for baseball bats. League parents trying to purchase a bat for their player may encounter bats stamped with different league certifications. Some bats may be stamped as being Little League certified or approved while others may be stamped as being PONY certified or approved. Softball bats may also be stamped as being either ASA or USSSA certified/approved. Each of these competing leagues has a set of standards for equipment, but those same equipment standards are often the same between leagues. If you have followed the basic guidance provided above for purchasing a baseball bat then you should be compliant as the basic standards between Little League and PONY are nearly identical for purposes of our league. Starting in 2018 a bat with the new "USA Baseball" stamp will be considered legal. Similarly, Softball bats that conform to our general guidance should also be compliant. Currently our Softball program is umpired by ASA trained officials so ASA approved bats will be compliant. For our intertown divisions (Majors, and Triple A) the bats should be labled as Little League approved. The league provides only a catcher's mitt as part of each team's equipment bag. Players are expected to bring their own gloves to practices and games. There are many kinds of gloves available on the market. Parents looking to purchase a glove for their young player may discover that their retailer stocks catcher's mitts, 1st baseman gloves, infielder's gloves, and outfielders gloves. Differences between the gloves will be seen in the web, size of the pocket, and padding. Typically an infielder's glove will have a smaller pocket than an outfielder's glove. Unless your child is going to play the catcher's position or 1st baseman's position you will probably do best choosing a multi-purpose glove. This is especially true for our younger divisions where the players are given the chance to try different positions and rotate frequently. Choosing the right size glove is also important. One of the common problems coaches encounter is a player with a glove that is either too big or too small. Obviously the fit should be comfortable. The pocket of the glove should be large enough to accommodate the ball used by your child's division (more on balls later on). To help parents select a size for their child we have provided some general guidance below. Consider this the starting point for when you do your shopping. If you shop at a large specialty sports retailer, then don't be afraid to ask the staff who should be knowledgeable of the different gloves that they sell. Used gloves are another way to go. Purchasing a glove from a consignment shop or borrowing one from a friend can be an effective way to save money in those cases where your child is trying the sport out. Note however that you should inspect a used glove carefully to ensure that the web is intact, laces are secure, there are no holes in the pocket and that it still has sufficient padding. 9 to 13 9" - 10" 11" - 12"
Under 8 9" - 11" 10.5" - 11.5"
9 to 13 11" - 12"
Wrapping a ball in the glove to help form the pocket is also another useful method of helping form the right shape required to catch the ball. Whatever you do, don't microwave or leave your glove on the dashboard of the car in an effort to warm the leather. 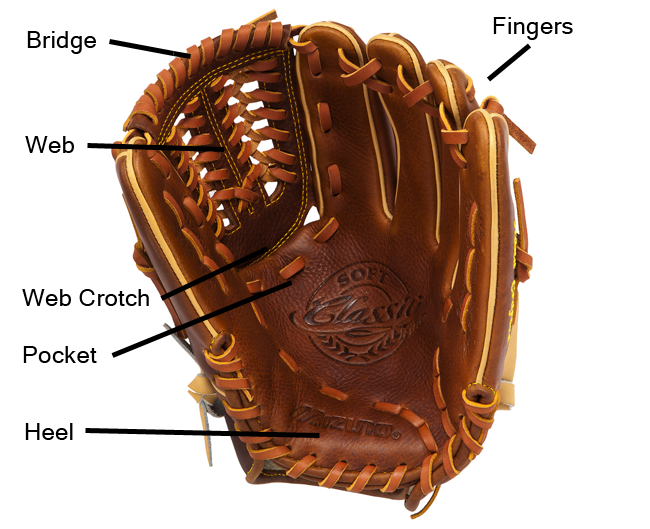 Putting your glove in the microwave or leaving it in the direct sun with excessive heat will only cause the leather to deteriorate prematurely. We use several different size balls in our programs. While the league provides balls for games and practices, players and parents may want to have their own balls for their own use. Knowing which ball to use will help keep your player safe and provide for a consistent experience with what the league provides. Below is some general information on the kinds of balls used by the league. Tee balls are roughly the same size as the balls used in our Minors and Majors division which is about 9" to 9 1/4" in circumference. They are however generally lighter being on the order of about 4 - 5 ounces and noticeably softer. Tee Balls should be specifically marked as such. Balls are white with red stitching. The ball used by our leagues' minors and majors divisions are 9" to 9 1/4" in circumference and weigh between 5 and 5 1/4 ounces. Balls are white with red stitching. The softball used by our Farm league division for girls in grades 2-4 are slightly smaller than those used by our junior and senior divisions. Farm league players should look for balls that are 11" in circumference. It will weigh between 5 1/2 and 6 ounces. Balls are vibrant yellow with red stitching. The standard softball used by our junior and senior divisions is 12" in circumference and has a weight between 6 1/4 and 7 ounces. Balls are vibrant yellow with red stitching. You will find two different quality of balls readily on the market. Game balls most often sold in bulk contained within a box or sold individually. Game balls have a leather exterior and are made to behave more consistently during play. Game balls are generally more expensive due to the materials used as compared to practice balls. Game balls may be switched out during play as they get damaged or the surface becomes scuffed. Practice balls are often sold in bulk within a 5 gallon bucket at the big retailers. The also are available to purchase in smaller quantities or even as single balls. Practice balls are made of different materials than the game balls and more durable. Practice balls are not used during game play.